Doha, Qatar: Stars of Science, the region’s leading ‘edutainment’ reality TV show that has inspired innovators and entrepreneurs across the Arab world, returns this week on MBC4 for its eighth season. Initiated and supported by Qatar Foundation for Education, Science and Community Development (QF), the new season brings a fresh approach, which will see candidates contributing creative solutions to regional problems within the information technology, energy, environment and health sectors. Stars of Science (SOS), in-line with QF’s mission to encourage a culture of quality and excellence, serves as an instrument to foster creative and innovative thinking among the next generation of ambitious science and technology problem solvers. For eight years, audiences across the Arab world have seen groups of industrious innovators turn their impactful ideas into reality, developing and selling products around the world, picking up more than 50 international and regional awards along the way, and sharing their knowledge and expertise on an international scale. Success stories of the show’s alumni, like Anwar Almojarkesh, founder and CEO of Braci, which specializes in assistive technologies for the hearing impaired, send a strong message to Arab youth. Having narrowly missed out on a chance to reach the finals of the program, he went on to successfully launch his business in Denmark and the United Kingdom, raising more than 1,000,000 USD from international angel investors, governments and incubators. “Stars of Science is the most amazing platform to kick start innovative ideas. Taking part in the program has been one of the most significant and rewarding learning experiences of my life,” said Anwar. His success in raising external funding beyond the program has been replicated by 15 fellow Stars of Science alumni who have also successfully raised more than 9 million USD between them to support the further stages of developing their products. In addition to their ability to fundraise, the power of SOS alumni also lies in their capacity to inspire young minds to pursue their dreams and contribute solutions to regional problems. Since leaving the program as a finalist in Season 5, Mohamad Al Kuwari can regularly be seen promoting science and technology education to young people as an active public speaker. Now a successful serial inventor and award-winning entrepreneur, Mohamad continues to innovate for social good, currently working on a project with fellow alumni Mohamad Islam that aims to provide solutions for the visually impaired through smart glasses offering tailored features from currency recognition to safety alerts. He has also developed an acclaimed ‘culture and heritage focused’ mobile app called ‘Galayal’ in partnership with fellow alumni Dr. Mohammed Doumir. 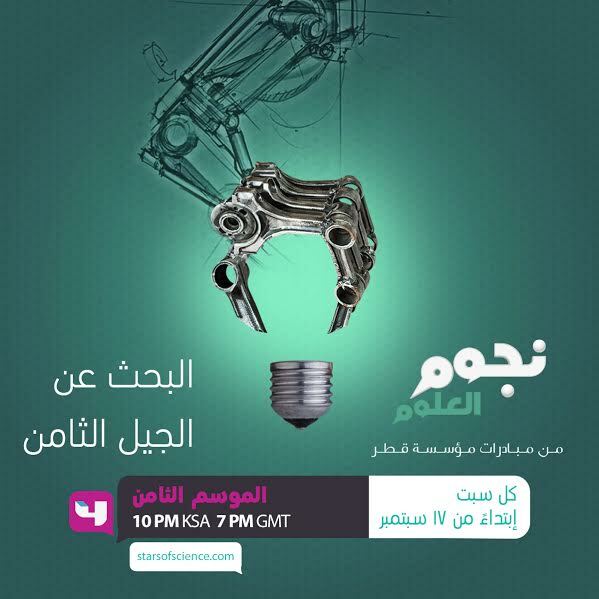 During the search for the region’s most promising innovator, the first three episodes will focus on shortlisting innovations that revolve around the biomedical, ICT, energy and environment sectors, reflecting the region’s research priorities. Casting will culminate in a Majlis episode, which will feature the best and brightest applicants. The nine selected candidates will fiercely compete against each other over the course of two newly introduced stages of the program: the prototyping and customer validation rounds, which include a focus group of potential users. Throughout their journey, innovators will be challenged to develop and enhance their projects to benefit communities and generate a global impact. The four candidates with the most viable projects will then move on to the life-changing finale, where they will earn a share of 600,000 USD of seed-funding after an online public vote and jury vote. This season’s jurors are a forceful group of science and business thought leaders that include Dr. Ahmed K. Elmagarmid, Executive Director, Qatar Computing Research Institute; Prof. Abdelhamid El-Zoheiry, President of the Euro- Mediterranean University (EMUNI) and Senior Advisor to the Minister of Higher Education and Research in Egypt; as well as Dr. Hosni Ghedira, Head of the Chemical and Environmental Department of MASDAR and Director of its Research Center for Renewable Energy Mapping and Assessment. Aysha Al Mudahka, CEO of Qatar Business Incubation Center, joins the much feared but highly respected science advisor and Executive Director of ESCWA Regional Centre for Technology, Prof. Fouad Mrad, as a permanent juror. Khaled Al Jumaily, loyal contributor to the program and its mission, will also return as host. Stars of Science’s viewers can engage with the program by accessing online exclusives via its newly designed website www.starsofscience.com. The audience can also participate by joining the Stars of Science community through the program’s active social media pages (the show’s Facebook page has grown to more than 2.3 million followers this year, while its Twitter account has grown to 83,000 Followers; YouTube and Instagram channels alone combine over 50,000 followers). Stars of Science airs every Saturday on MBC4 at 10pm KSA / 7 pm GMT starting September 17th till November 19th 2016. Today, MBC Group includes 20 TV channels: MBC1 (general family entertainment); MBC2 and MBC MAX (24-hour western movies); MBC3 (children’s edutainment with a mix of both local productions and western acquisitions); MBC4 (entertainment for young families with a female-focus); MBC Action (an indigenous adrenaline-packed channel targeting young males with local and homegrown productions); MBC Variety (Western films and general entertainment with uninterrupted broadcasting); Al Arabiya News Channel (the 24-hour Arabic language news channel); Al Hadath (an extension of Al Arabiya News Channel with a specific focus on real events in the Arab world and beyond); Wanasah (24-hour Arabic music channel); MBC DRAMA (24/7 Arabic drama); MBC MASR (general family entertainment geared towards the Egyptian family); MBC MASR 2 (providing the Egyptian audience with superior quality entertainment); MBC + Drama (exclusive on MyHD); MBC Bollywood (delivering the freshest in Bollywood content geared towards the region via an Arabized interface); and most recently four sports channels, MBC PRO SPORTS (geared towards the “Saudi Football Premier League” fans in the Kingdom); and MBC USA (the channel is present on “Dish Network” in the US, and targets Arab audiences aboard; the channel is dedicated to offer and broadcast a wide range of content from the prominent MBC channels including movies, series and global formats).